“The biggest thing is that I’m finally healthy,” said Wil Myers before a game with the Giants. After breaking his wrist in the fourth game of the year in 2014, and then following that up with another broken wrist (the other one) about six weeks later, Myers is happy to have his health. Those broken wrists did a number on his game. After the first wrist broke, Myers played through it. “I still have a bone that sticks out,” Myers said as he points to a protrusion. “And any time I turned this wrist over, this tendon right here was very painful.” Even that first half of last year, before the second injury, Myers had below-average power (.126 Isolated Slugging, .145 is average). It was worse when he came back from the second broken wrist after 81 days away. “I just didn’t have it,” Myers said as he shook his head. “This forearm looked like a baby’s forearm, I had no muscle.” That’s when his performance really tanked, as his .055 ISO and overall offense that was 50% worse than league average can attest. This is what it looks like to cheat on a fastball and get all messed up in table form, featuring the pitch type values that weigh outcomes per 100 pitches of each pitch type. A good fastball hitter lost the ability to catch up to cheese and the rest of his game followed. This is what it looks like to cheat on a fastball and swing with one hand in game footage, with late 2014 on the left and his current swing on the right. You might notice what he means when he says that “My swing was so long. I didn’t have a top hand to help me stay short.” Easier to spot is that he starts his swing earlier and finishes the 2014 swing more awkwardly. The injury also hurt him when he tried to extend. “Anything away I just couldn’t hit,” Myers admitted. This is what it looks like to swing with one hand in a heat map form, with late 2014 on the left and 2015 on the right. Now, with two hands, Myers is learning from the ordeal. “Just gotta make sure my top hand gets to the ball,” said Myers. “My bat loads behind my head, so my swing is more flat than a lot of guys.” So the top hand is huge for him. Pair this with the fact that he’s batting leadoff regularly for the first time in his career, and maybe we’re talking about a fastball thing here. “I’m getting good pitches early in the count, with the guys behind me, that helps a lot,” Myers said. Though the numbers haven’t really shown that protection is a real thing, the players believe in it for the most part. Considering that his fastball percentage is only up 3% and the difference between the first inning and the second inning in terms of fastballs is nearly 5%, maybe pitchers aren’t really challenging Myers any more than usual. Especially since he’s being more aggressive and swinging earlier in the count, when pitchers are trying to get strikes with their fastballs. After all that getting healthy, playing center field was no big deal. He pointed out that he’d played there a ton in 2012, and that it was just about learning all the ballparks. In game play, the biggest difference was the action on the hits as they come to him. “A ball to my right, the ball kinda goes away from me, and a ball to my right in right field was coming back,” he said. Just a little like telling the difference between a cutter and a sinker, really. Wil Myers has some huge mitts, but he’s not sure that mattered much on the plays where he got injured, and there’s nothing he can do about them. “I was born this way,” he deadpanned. But any wrist injury is a such a big deal, he agreed. Last year? “It wasn’t that fun.” Now that he’s healthy, he’s having fun again. 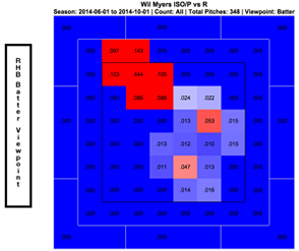 We hoped you liked reading Wil Myers is Finally Healthy by Eno Sarris! Not a CF and not a leadoff hitter. Myers drew his first walk in his 54th plate appearance of the year. He has six in the next 65 PAs which, while not stellar, is in line with career rates and entirely workable. His OBP is low because his BAA is low. And his BAA is low because he has an atrocious LD rate so far. If he fails as a leadoff hitter, it will be because of the bad contact he’s made, not because of a walk rate that will wind up stabilizing around 9-10%. I suspect the quality of contact will improve and he’ll wind up providing solid enough value in the leadoff spot. Now the defense… that’s just awful. He takes bad routes from an inexplicably shallow starting point, usually running with his head and glove up in the air. The number of balls that have landed three steps behind him while he curls around under it flailing his glove in the sky is pretty depressing. I suspect that can be fixed a LITTLE bit, but only enough to close the gap slightly between him and the second-worst CF defender in the game. MLB average OBP is .313. 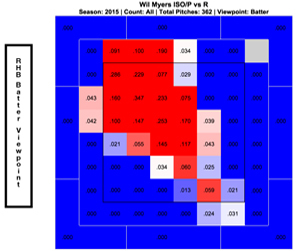 Myers’ OBP is .320 in Petco Park. That’s above average OBP. Not “pitiful” by any means. 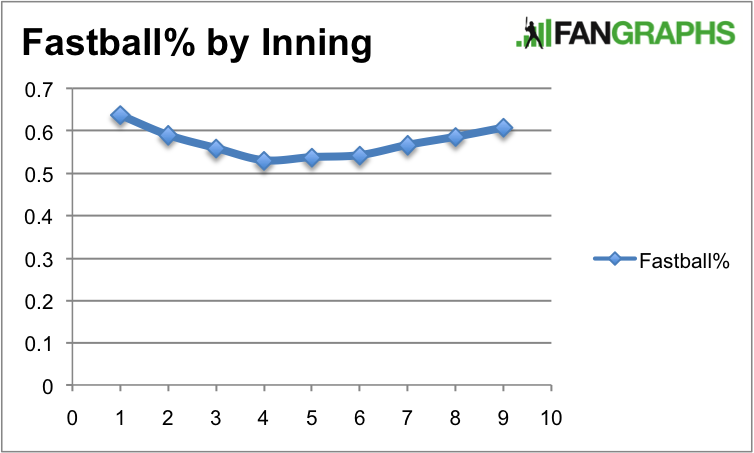 That might not be an important metric, but it is the only thing that really counts (especially for your leadoff hitter) – since scoring is how you decide who the winner is.